In 1840 Sir George Simpson, Governor of the Hudson’s Bay Company, announced that an agreement had been reached with the Wesleyan Methodist Church for the establishment of missions in the interior. While the Methodist missions were short-lived it’s said this agreement paved the way for future cooperation between missionaries and the Hudson’s Bay Company and by the 1850s the Company’s stand against missionary work in the northwest had weakened considerably. In 1858 there began a period of “intense rivalry and rapid expansion of missionary activities as far north as the Mackenzie River Delta”. 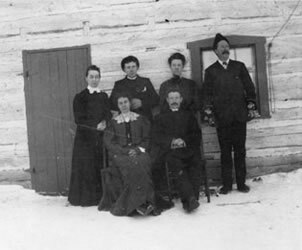 It was in that year that Archdeacon James Hunter, with the Church Missionary Society (Church of England) travelled into the Northwest Territories as a guest of the Hudson’s Bay Company. He carried a letter of introduction from Sir George Simpson that ensured the cooperation of Company officials in the Mackenzie valley. It was his task to find suitable sites where a Church of England mission and school could be built. Archdeacon Hunter travelled with the fur brigade and when he reached Fort Resolution discovered that Father Pierre-Henri Grollier, a Roman Catholic priest and member of the congregation of Oblate of Mary Immaculate, busy building St. Joseph’s Mission on Moose Deer Island close to Fort Resolution. Perhaps fearing that the Protestants would gain an advantage in the race for Mackenzie valley souls Father Grollier joined the brigade and travelled with Archdeacon Hunter to Fort Simpson. At Fort Simpson Reverend Hunter established St. David’s Mission, which became the headquarters for Church of England’s missionary work in the north. The energetic Father Grollier also established a mission at Fort Simpson and went on to establish missions at Fort Providence (1861), Fort Rae (1859), Fort Norman (1858-60) and Fort Good Hope (1860). In 1859 Reverend William Kirkby took over the work of Reverend Hunter in Fort Simpson. He finished building the mission and also built a mission school. A second Church of England missionary arrived in the north in 1862. Reverend Robert McDonald established a mission at Fort McPherson on the Peel River to serve the Gwich’in people. In 1865 Reverend William Bompas arrived in Fort Simpson and from this base became a travelling preacher visiting Aboriginal camps and bringing the gospel to the people. In 1870 Reverend Bompas also became the first Church of England missionary to visit the Inuvialuit, although it was not until 1896 that Reverend Isaac O. Stringer established a permanent mission for them. The intense competition between the Catholic and Protestant missionaries was confusing for the Dene and Inuvialuit. The situation took many years to stabilize with most northern communities eventually becoming predominately Catholic and others mostly Protestant.